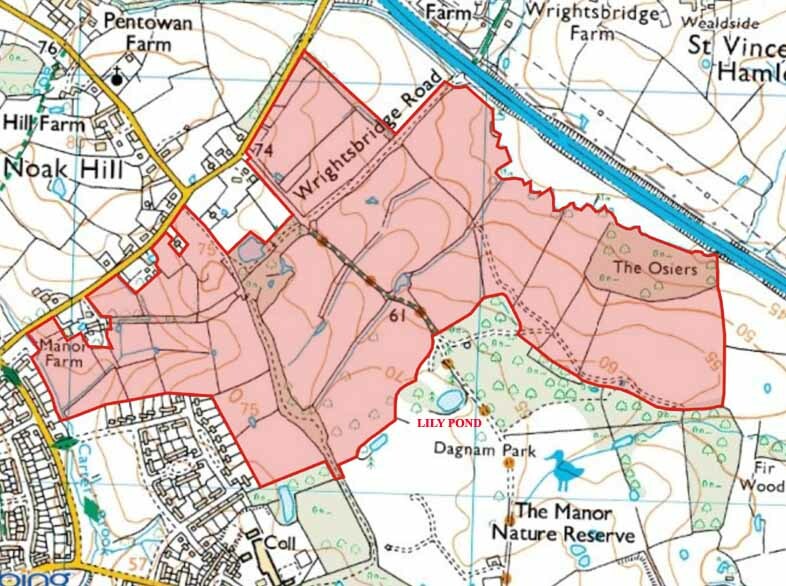 Prior to the planning application to change the land from agricultural use to Nature Reserve consultants were contracted by the Council to undertake a series of surveys of the additional land these reports are summarised below with links to the full reports. These reports are taken from Havering Council's Website. The pdf files can be downloaded directly from the council site here. Below some key points from management plan, remember the plan was written for the extension but much of what is written will also apply to the rest of the park. The full Management Plan can be downloaded as a pdf file, please be patient for download to complete it will depend on the speed of your connection. It is clear from the report that the large numbers of deer in the park are causing a build up of ecological problems. Pond condition: Four existing ponds are silted up, over shaded, degraded and trampled. Three further shallow depressions have been trampled, silted up and are shaded. Woodland regeneration: there is limited regeneration of oak and hornbeam in the woodland strips, limited scrub layer and climbers. Ground flora regeneration: ground flora of woodland areas is typically poor and disturbed/trampled by deer. Tree management: Several veteran and mature trees have been identified within the site, further younger scattered trees are also present, and will require monitoring and may require protection, pruning or removal. Scrub regeneration: willow and bramble scrub are degraded and grazed heavily in the south eastern fields. Hedgerow degradation/fragmentation: hedges are becoming fragmented, scrubby, trampled and over shaded in places. Ground flora was typically poor and not able to regenerate due to shading, trampling and grazing. Grassland: grassland areas predominantly in the eastern section (previously arable fields) require management to ensure enhancement of grassland meadow species of plant and invertebrate, and to control the spread of scrub. Trampling and overgrazing: deer are inhibiting the restoration of ground flora in woodland and hedgerows, and of tree and scrub regeneration. These two reports contain much information on our veteran trees incuding photographs and maps they can be downloaded beneath the report's conclusions. Conclusions; The tree stock is well represented through all age classes including 14 veteran trees and a large number of future veterans, given the size of the park this can be considered to be a high density population and establishes the park as a site of great importance. Because of the abundance of trees that will become veterans there is no need to try to preserve the longevity of the veteran trees through remedial tree works. Instead it would be better to implement a policy of naturalistic management and allow them to remain in a state of managed decline as they will be quickly succeeded by a new generation of veterans. The site was used by moderate numbers of common pipistrelles and by low numbers of soprano pipistrelle, noctule and Myotis sp. bats. There were numerous trees within the site which were suitable for roosting bats and field boundary features were used for foraging and commuting. Management of the site should ensure that field boundary features and veteran trees are maintained, appropriately managed by approved arboricultural contractors, and (where suitable) enhanced. The implementation of such a management plan would benefit the local conservation status of bats, and offset any adverse impact caused by increased visitor numbers to the Park. A programme of habitat enhancement could be implemented to further increase the value of the habitat for bats. This could include the inclusion of open water features, such as ponds; filling in any gaps in the hedge-lines or other linear features; increasing invertebrate numbers through appropriate, native planting and log pile/hibernacular/loggery creation; increasing roosting pportunities through the inclusion of bat boxes. Read the full Bat Survey here, be patient for the download. Appendix 2: Photographs. Twenty photographs of various habitats within the extension. Appendix 3: Plant Species List. Appendix 4: Legislation & Planning Policy. Useful account of all relevant wildlife laws. Appendix 5: Hedgerow Assessment Criteria.